One bright, sunny day on September 19, 1991, Helmut and Erika Simon were climbing the Ötztal Alps, located on the border of Austria and Italy near the idyllic town of Innsbruck. They were German tourists on a pleasant day hike—but when the couple decided to head off the path between mountain passes, they received the shock of their lives. Buried in the ice on the path, they thought they saw the torso of a newly deceased hiker, his head down and his arm unnaturally bent over his chest. Their macabre discovery caused a flurry of activity in the coming days as mountaineers and researchers alike tried to free the body from the snow. But as they extracted the remains, one thing became disturbingly clear: this was no hiker. 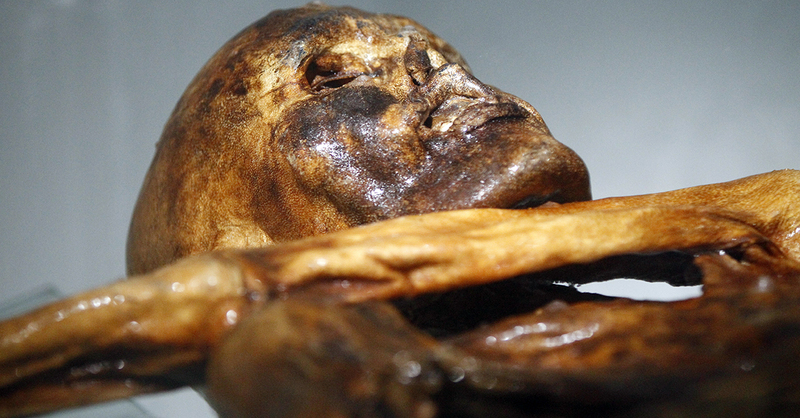 Instead, the Simons had just discovered the oldest natural mummy in all of Europe, preserved in ice. When he was alive, the iceman lived somewhere between 3400 and 3100 BC, his tight, shriveled remains weathering thousands upon thousands of years before they were unearthed at last in the 20th century. Who was he, and how did he end up on this desolate mountain? What were the strange markings researchers soon noticed on his body? And perhaps most puzzling of all, how did he die, and what were his last moments like? The answers proved astonishing. Over the next decade, scientists extensively examined “Ötzi,” bestowing him the nickname in honor of the Ötztal Alps. What they found revealed incredible details about human life long ago. 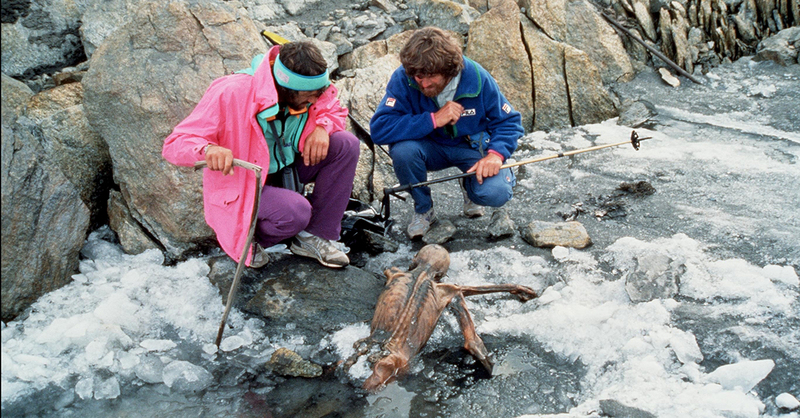 Ötzi was small by today’s standards, clocking in around five-feet-three-inches and weighing just 110 pounds. He was 45 when he died, and from pollen and enamel analysis researchers were even miraculously able to tell that he had grown up in what is now known as the village of Feldthurns in present-day Italy. In fact, his preserved body was a forensic treasure trove. They knew the last two meals he had consumed before his mysterious death: meat, herb bread, and a side of roots and fruit. They knew he had whipworm, a kind of intestinal parasite that still affects humans today, and that he was likely taking medication for it in the form of a birch fungus. They knew he had been sick three times in six months before he died. They even knew he was lactose intolerant. Some of the forensic evidence could only lead to educated guesses: curiously, Ötzi had traces of not only copper but arsenic in his hair, leading some researchers to believe that he was involved in copper smelting. Supporting this hypothesis, he also had in his possession an ax composed almost entirely of copper and likely made in relatively distant Tuscany. For Ötzi, the weapon was likely both a valuable tool and a symbol of his status. Nonetheless, his bones indicated he spent a long time trekking through hilly terrain, and other researchers have thus suggested that it was more probable he was a mountainous shepherd rather than a copper smelter. But strangest of all the small secrets hidden on Ötzi’s ancient body were the thin markings on his limbs, joints, and back; Ötzi, researchers discovered, was covered in tattoos. His no less than 61 tattoos were grouped into 19 sets of thin black lines only a few millimeters wide but up to forty millimeters long. They were possibly created from fireplace ash, and they were often parallel to each other, circling his knees, wrists, and ankles. 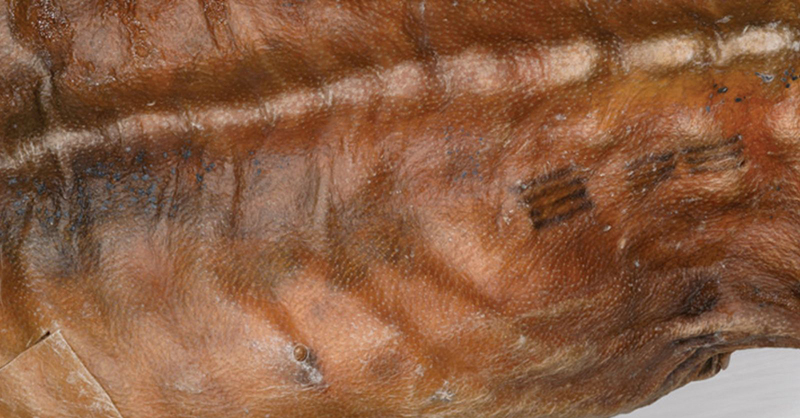 Of course, we’ve long known that our ancestors tattooed themselves, often for tribal purposes—but when an examination of Ötzi’s bones came back, researchers realized they had something ground-breaking on their hands. 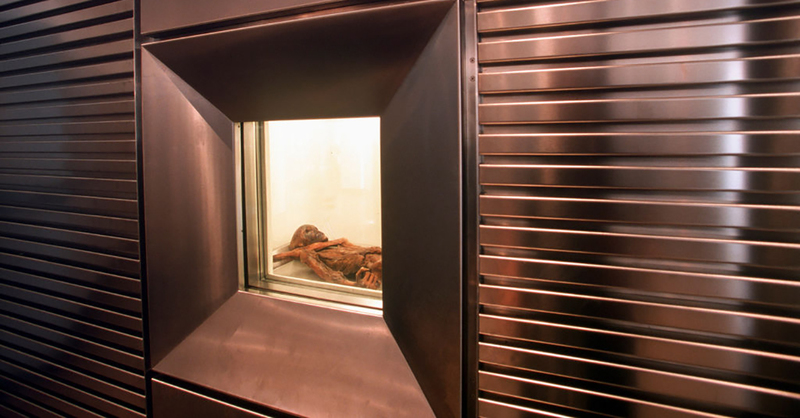 You see, while performing a radiological exam on the mummy’s bones, scientists realized that many of the tattooed sections corresponded to degenerated or compromised bone areas on Ötzi’s body, like the signs of overuse on his knee joints or the spondylosis of his spine. Wherever there was degeneration, you were likely to find a tattoo. Astounded, they began to believe these were not mere tribal markings or decorative tattoos, but a Neolithic form of therapeutic acupuncture for Ötzi’s joint and bone pains. If they are correct in their interpretation, Ötzi’s ink pre-dates what we once thought was the earliest form of acupuncture by a staggering 2,000 years. Researchers seemingly had an abundance of information: they knew where Ötzi was born, knew that he was 45 when he died, knew his last supper. Nonetheless, the riddle of his death remained a mystery for decades. Initially, archaeologists suggested that he died of exposure, or else that he was a chieftain given up for a ritual sacrifice. But then in 2001, an X-ray scan revealed the truth, showing that Ötzi had an arrowhead embedded in his left shoulder just below his lung. It was a nasty wound that had at once burst his nerves and blood vessels; even with today’s medicine, the same injury would have likely still been fatal. But this discovery was only the beginning of his end, and Ötzi’s body still had one last secret to confess: the utter violence of his final moments. Further DNA analysis revealed that there were blood samples of not one but four other people around Ötzi. Scientists found blood on his knife, two separate samples on his arrowhead, and one smeared on his coat. Using this evidence, researchers posit that he was attacked and managed to kill two of his foes with one arrow and possibly wound one with his knife. As for the fourth sample on his coat, evidence indicates that he may have carried a fallen ally on his back before he died—indeed, he may not have died alone. The shaft of the arrow was removed before his death, and his mummified facedown posture hints that a comrade was attempting to pull the arrow out before Ötzi succumbed to his cold fate. Through this forensic evidence, Ötzi’s life slowly comes into focus. And yet, even with all we now know about Ötzi, some secrets elude us. Where was he going, and why was he brutally attacked and killed? Who witnessed his death, and who mourned his passing? For us, Ötzi’s existence is measured in the preserved clues his ancient body left behind, but for Ötzi himself, it was a life filled with daily ephemera: hopes and fears, rivalry and friendship, motives and hurdles we are not privy to. Ötzi was a man weathered by illness and the harsh realities of the Neolithic period, a forager beset by the aches and pains of age, and a tragic figure who slipped from a short, violent life into an icy, eternal grave. We may never know more than that.